2. Where can I find an information on the admission? 3. What colleges and majors exist at NTUU KPI, and what is the tuition fee? 4. What is the preparatory study for international students? 5. Who is entitled to scholarship? 6. Can student get scholarship for studying at NTUU KPI? 7. Are students allowed to work in Ukraine? 8. What are the grounds for a student’s academic leave? 9. On what basis a student can be dismissed from the University? 10. Does a dismissed student have the right to resume studies at NTUU KPI? 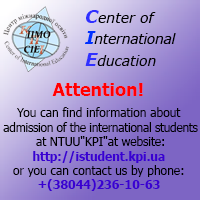 Foreign citizens can be enrolled at NTUU KPI according to the Contract for Study. Enrollment is executed by the University Admission Board. The Student shall submit an online Application form, copies of Passport, Diplomas/Certificate, Transcripts, translated either in Ukrainian, Russian, or English. For more information see Admission Policy and Online Application. The main aim of the Preparatory Department is to improve student's knowledge, skills and abilities that are necessary for successful studying at the Ukrainian universities, and helping them in their adaptation to the new social and cultural life. Students will study the following subjects: Russian, Ukrainian, Mathematics, Physics, Chemistry, Informatics, Drawing, The Basics of Economy, Biology, Economical and Social Geography. - the second term lasts from February till June and is followed by 2 weeks of tests and exams. After successful completing of the Preparatory School study the students will get the State Certificate that allows to enter any university in Ukraine according to the chosen specialty. Full-time students, which tuition is paid from the State budget. 6. ;Can student get scholarship for studying at NTUU KPI? You may get the information at the Ministry of Education in your country. You can also try to get a scholarship from the State Authorities of your country of residence, as well as the private funds and companies. Foreign students can work in Ukraine only if they have a work permit. - Extraordinary cases: natural calamities; difficult family situation, for example, the necessity of taking care of a sick family member. - For violating the terms of tuition contract. 10. Does a dismissed student have the right to resume studies at NTUU KPI? A dismissed student has the right to resume the study at the university within 5 years after being expelled, if an appropriate reason is provided, and if there are vacancies. The Rector of the University decides whether the student can resume his study despite the duration of his/her break in studying, dismissing reasons and the form of study. If the student was dismissed from the first academic year, he/she can resume the next academic year after the successful passing of all obligatory exams till the beginning of the next academic year. The student should submit an application to the Rector regarding his/her study resuming. Student's application for study resuming should be approved and signed by the Dean of the College/Institute. The student can be resumed during vocations. The study resuming procedure is approved by the Rector's order.